Some might ask, “Why keep ducks?” Several years back I read a news article about a woman in Hickory Hills, IL who kept two ducks in her backyard. Neighbors complained and the city ordered her to remove the ducks. She appealed and lost. No livestock allowed in the City of Hickory Hills. Her defense was that the ducks were her pets and she never intended to eat them. I was not there when the judge ruled but I imagine it went something like “Madam, ducks are not pets! They are food.” Now that I keep ducks, I know that the lady’s ducks probably were her pets, and also that she was addicted to their rich, golden-yolked eggs. Nutritionally speaking, duck eggs have higher levels of Vitamins A and D, and Omega-3 fatty acids compared to chicken eggs. Although, to be fair, they contain twice the cholesterol as chicken eggs. Overall, ounce for ounce, you get more bang for your buck from duck eggs. Duck eggs are also alkaline, creating a more acidic environment in the body, which some studies suggest has health benefits. In the kitchen, duck eggs bake up fluffier and richer. They are much larger than chicken eggs though, so when a recipe calls for one large egg, you have to break and beat one duck egg and measure out two ounces. As a table egg, they are delicious. The best way to prepare them is soft-boiled. The yolk is positively decadent. Really, I use them in all the ways you would use a chicken egg. I even sneak them into my fussy child’s breakfast burrito, and she is none the wiser. The eggshells can even help you earn some spare cash. They are extremely thick and are treasured by Eastern European artists who make the fine pysanky. I saw a couple of ads on Etsy that offered a dozen blown out eggs for $20! But back to my original question, when neighbors heard I had ducks, not chickens, their first question was always, “Why ducks?” Probably because I like to be different. Plus, when I started my research I learned that ducks are quieter than chickens, a good thing when you live close to your neighbors. They are also hardier than chickens, a definite benefit when you have my schedule. I eventually narrowed my search down to Pekin and Muscovy, both smart, sociable breeds that are good layers. I showed my kids pictures of the finalists and they decided Muscovy were weird looking, so we went with the Pekin. The Pekin variety also happens to be very common, and in April (Easter time of course) The Feed Store on Harlem Avenue had about 100 Pekin ducklings, at $5 a pop. I bought four hoping to get two females to lay eggs. The babies started out in a large rubber box with a heat lamp, but QUICKLY outgrew it. First, I moved them to the bathtub, but the smell was unbearable. So, I then moved to the garage in the bottom half of my Labrador’s crate. In short order, they could climb, or rather, flop out of the crate. Fortunately the weather was warming up and their yellow down was being replaced by white feathers. With feathers, they can keep themselves warm so I did not need to confine them with the heat lamp. The whole family struggled with the idea that they had to stay outside. They were so adorable that we had to remind ourselves they were farm animals, not house pets. As they grew, it became clear that I had one boy and three girls. 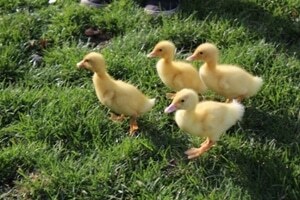 It also became clear that one female was not a Pekin but an Aylesbury, an unrefined duck that none of us liked. Simultaneously, I realized that four full-grown ducks were two too many for my garden, so I found a young couple to take the male and the Aylesbury. Settling in with “the girls,” as we call them, has been a breeze. They don’t need to roost, so if I forget to confine them to a side yard enclosure at night, finding their eggs in the morning is a treasure hunt. They are the easiest animals to care for, nearly maintenance free. The most important thing to keep in mind when caring for ducks is they require water to drink at all times. Besides the dry poultry feed I provide them, they forage, picking up flies, grubs, and worms, and washing it down with big messy billfuls of water. They also like to play in the water, so I got them a blue plastic baby pool. A couple of times a day I found them splashing and dunking themselves to cool off and clean their brilliant white feathers. When I have time on my hands, I like to water my ducks, squirting them with the garden hose while they arch and stretch like supermodels. The phrase “like a duck to water” takes on a new meaning when you actually own one. atoes are a particular favorite. Luckily, they are trainable. When I catch them in the garden I yell at them from the house to clear out and they grumblingly oblige. As winter has come, I insulated their house (my children’s old play house) with straw on the inside and burlap on the outside. I purchased a large electric water bowl to keep their water from freezing. It’s 17 degrees out as I write this. I worry about them out there, but tell myself that they will be fine. After all, they are wearing down comforters. Audrey Cosgrove is a native Chicagoan, a self employed attorney and former Illinois Master Gardener. She lives in Chicago’s Independence Park neighborhood with her husband, two lively children and a small assortment of furry and feathered friends. She has a little house, but a big backyard where, in addition to growing the usual perennials and vegetables, she is experimenting with 4-season growing and growing super hot exotic peppers.